Some time ago I've read about Beer Can Chicken. Is it safe to bake a can on the grill (or in the oven) like this? Doesn't it give off any chemical flavours? I'm not sure if its dangerous, but if you are worried about the can you can get various tools, designed to cook a chicken like this. Beer can interiors are coated with an epoxy that contains Bisphenol A (BPA). Is the popular method of cooking a chicken perched on an open beer can really a good idea? Some studies have linked BPA to cancer and other harmful health effects. To evaluate the ramifications of cooking chicken on a beer can, we roasted two whole birds, one set on an open beer can containing 6 ounces of beer and the other on a stainless-steel vertical roaster with the same amount of beer poured into the reservoir. After roasting the chickens, we collected their drippings and stripped each carcass, grinding the meat and skin to create homogeneous samples. We sent the samples to a lab to be evaluated for BPA content. In each chicken, the BPA measured less than 20 micrograms per kilogram, leading us to believe that the beer can cooking method is safe. (The Food and Drug Administration’s current standard for exposure is 50 micrograms per kilogram of body weight for adults, or 3,400 micrograms per day for a 150-pound person.) 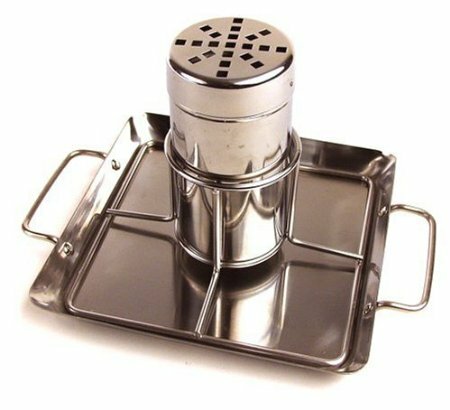 For those who have any remaining concerns, there is always the vertical roaster, which works just as well as a low-tech option. Published May 1, 2011. From Cook's Illustrated. The beer can shouldn't be able to rise above the boiling point of the liquid inside until it is empty. Your chicken should be finished cooking long before that. Obviously, the aluminum of the can itself isn't a safety issue anyway. If you are worried about the paint on the can, you can either buy the Poultry Pal that Sam linked to, or take some sandpaper to the beer can and scrape it all off (before opening the can of course). For ease of removal later, you should be coating the can itself with fat/oil before inserting it into the chicken. Cook slowly. Last time I made it, I aimed for about 275f to 300f. If you are doing it on the grill, use a pan to catch the drippings and prevent flare up. I also basted occasionally to help create a more flavorful crust (not to prevent drying out, since the steam inside does that wonderfully). First: This is delicious Second: I simply use a small jar (from jam e.g. ), which is about the same diameter as a beer can and simply pour the beer into the jar and the jar into the chicken. --> It is absolutely non-toxic and can be put in the dishwasher to be cleaned. Cook's Illustrated has tested beer cans enough that it would be totally reasonable to assume that Beer Can Chicken is safe, but if you want to avoid the can without spending money on a special pan, I just thought of an alternative to the beer can. 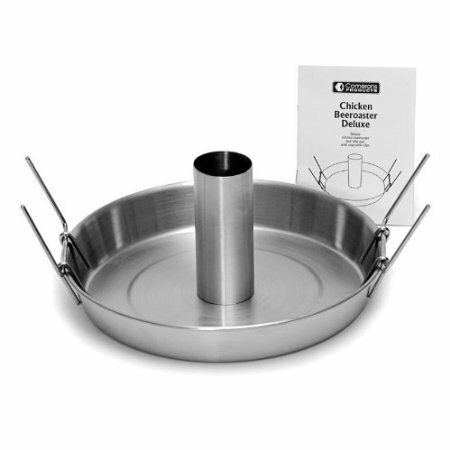 If you have one...take the funnel section from angel cake pan, or tube pan...it fits perfectly! You should place it in shallow pan with whatever seasonings you want...I added a little water...with garlic, and will monitor for low water. Also not sure of the safety aspect of this. The point of the beer can is to provide moisture to the chicken as its cooking, so it doesn't dry out (and maybe add some flavor). An alternative method would be to brine your chicken at least 24 hours before cooking. This will give you the desired effect of the beer can, although may not look quite as interesting while cooking. I make this regularly in a regular domestic oven and it's delicious. properly cooked legs and dark meat with super juicy, tender breasts. The only thing I can think of that would give off any vapours would be the ink on the can, but as the oven is only at 180C and the can is surrounded by chicken, I can't imagine than the can get's hot enough for that to happen. I've only done it once in a kettle barbecue over charcoal and I used indirect heat and a meat thermometer to check the deepest part of the thigh was at the correct temp. IIRC, it was took a couple of hours. Not the answer you're looking for? Browse other questions tagged food-safety chicken grilling beer or ask your own question. Am I missing something with Beer Can chicken? How to make “salt-crust-baked” chicken? My applesauce has fermented, is it safe to bake with? 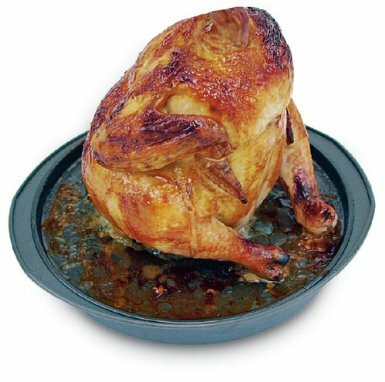 How to achieve a crispy skin when roasting a chicken?